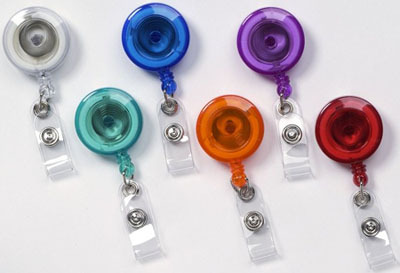 Plastic retractable badge reel with translucent body in a round shape. Select one type of attachment: Belt Clip, Spring Clip or Swivel Back. Comes in several colors. Reel diameter is 1.25 in. and cord length is 34 in. (865 mm). Features a 3/4" recess for customization. The clear vinyl strap attachment snaps into place to accommodate any slot-punched ID Card.